For Career Tech Education (CTE) students enrolled in community and technical colleges, demonstrating proficiency in math and English has been a significant barrier to program completion. 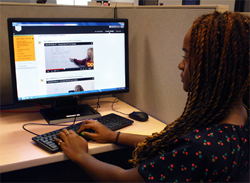 Bossier Parish Community College’s solution was to create a free, online course initiative “BPCC Open Campus™” with dual primary objectives: to better prepare incoming students for placement testing and to support those struggling to successfully complete first-year math and English coursework. In 2012-13, BPCC faculty and staff worked hand-in-glove to produce videos, edit documents, and upload learning materials into a standardized, student-friendly online design based on Cognitive learning concepts of “chunking,” repetition, retrieval practice and spacing. All Open Campus™ courses function identically and require minimal navigation for easy understanding and on-demand study. Brief lecture videos lead off every learning module and are followed by printable, open source documents and practice quizzes. BPCC’s first five courses—three maths, one grammar, and one reading—cost the College <$23,000 to produce and roll out; popularity of these initial courses quickly led to requests from CTE instructors for course additions to be used as supplemental instruction: two allied health prep, two networking and programming introductions, an advanced manufacturing and a soft skills course, among others have been added and have served as primary and supplemental resources for work-ready curricula. Each new course costs the College $3900 to produce. As of May 2017, lecture viewing across all 15 courses exceeded 2.5 million total minutes viewed. Significant numbers of students have now tested up or out of developmental-level courses, effectively reducing time to CTE course completion. Most notably, college algebra, watershed course for many CTE programs, realized increases in fall pass rates from 66.5% (f2012-f13) to average 73% (f2014, f15, f16). College algebra placement and enrollment rates, when compared with developmental-level, Intermediate Algebra, climbed from 52.5% to 60% in the same interval. Developmental math pass rates are also improving (from f2011-14 to f2015-16), with a sustained 3% increase in Beginning Algebra and a sustained 3% increase in Intermediate Algebra. In late fall 2015, BPCC parlayed its initial project investment and subsequent qualitative/quantitative results into a $1.8M US DoE “First in the World,” four-year grant to mobilize its design and provide an analytics base to better track and support student progress. Controlled Randomized Trials are now in progress in developmental math and English classrooms across campus. BPCC’s Open Campus™ has proven itself as among the most successful, low-cost ventures in the College’s 50 year history.